'Wheatly', the estate of E.D. Morgan III, built by McKim, Mead & White c. 1890 in Old Westbury. Click HERE to see a brochure from when 'Wheatly' was for sale. 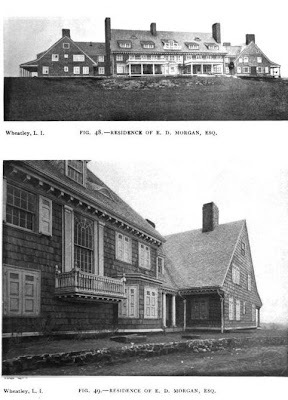 Picture from Architectural Record, 1895. Ungainly but not without a certain galumphing charm. i think the charm of wheatly was not so much the house but its "little medieval town" feel with its cluster of buildings around the house and the wall and the gardens. on the other hand, it is kind of an interesting arrangement with two houses on the ends of the middle piece and more attractive than some of the other large houses that just have two boxes stuck on the ends of the main house.